You are currently browsing articles tagged deworming. Are Moxidectin Horse Dewormers Effective against Encysted Small Strongyles? 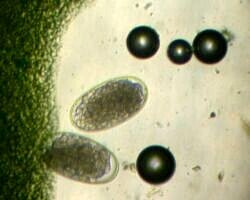 Microscopic strongyle eggs shed in horse manure hatch into tiny larvae that can infect a grazing horse (magnified 100x). An article published in the October 2008 issue of Equine Veterinary Education, “A Review of the use of Moxidectin in Horses”, has some exciting news about moxidectin, an antibiotic drug used to treat internal parasites in horses. In the past, moxidectin was thought to be effective against only some of the life stages of small strongyles, an internal parasite that infects horses. However, newer research indicates that moxidectin is very effective against all stages of small strongyles, including encysted small strongyles. The article also discusses why older studies seemed to show that moxidectin was not effective against encysted small strongyles. What’s so important about treating encysted small strongyles? Read the article ‘Target Small Strongyles with Fenbendazole Purge Deworming’ to learn how encysted small strongyles can pose a serious threat to the health of your horse. Moxidectin or fenbendazole – which dewormer to use? Immature small strongyles typically embed or encyst themselves in the lining of a horse’s large intestine, where they can lie dormant for many months, protected from the effects of most deworming drugs. In the past, a five-day double-dose of fenbendazole, another deworming drug, was thought to be the only treatment effective against encysted small strongyles in horses. 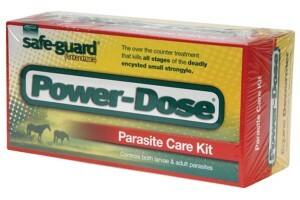 The study discussed in the article “A Review of the use of Moxidectin in Horses” found that a single dose of moxidectin horse dewormer is as effective against encysted small strongyles as the five-day double-dose fenbendazole deworming regimen known as the Panacur Powerpac or Safe-guard Power-dose. That’s good news for penny-pinchers, since a single dose of moxidectin costs around $10 compared to $30-$60 to administer the five-day double-dose fenbendazole regimen. It’s also good news for horses on farms where strongyles have developed resistance to fenbendazole. 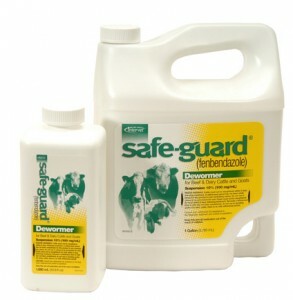 Which horse dewormers contain moxidectin? 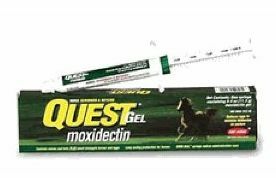 Moxidectin is available in the U.S. as Quest gel, or as Quest Plus with moxidectin and praziquantel, both manufactured by Fort Dodge Animal Health. Doesn’t moxidectin have a reputation for causing adverse reactions in horses? A recent study that compared the inflammatory consequences of larvicidal treatment of horses with either moxidectin or fenbendazole found that both drugs were efficacious against larval stages of cyathostomins(strongyles), but mucosal inflammatory responses to dead or dying larvae differed markedly between the 2 groups (Steinbach et al. 2006). Larvae killed by moxidectin elicited minimal inflammation, whereas larvae killed by fenbendazole elicited severe inflammation causing damage to the large intestine. Do you dread deworming your horse because it always seems to turn into a wrestling match? 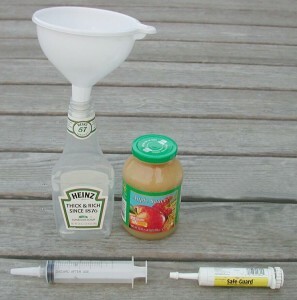 Use an empty syringe and a sweet reward of applesauce to train your horse to accept paste deworming calmly and happily.